Nokia has decided to cast off the negative aspersions brought on by poor financial results and has continued to develop new handsets with wild aplomb, with the latest showing up through the FCC in the US. 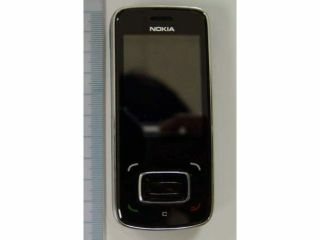 The handset, which appears to be a dual slider in the manner of the N95 and N96 is packing a 3MP camera and a stretched four way navigation pad with central control key, with the piano-black finish synonymous with the N-Series, although Nokia is calling it the 8208. It picks up 3G signal, which is always handy, although the brief given doesn't appear to be for European networks. Word is this is headed for China, but Nokia very rarely makes Asia-only handsets, so chances are this could be seen over in the UK. Other bits of fun include a 3.5mm headphone jack (something other manufacturers have seemingly found it hard to do) as well as a microSD slot, with no word on how much on board storage the thing is packing. The FCC tests are always an interesting read (well, once you wade your way through the millions of pages of legal boredom) especially as it shows that this phone was submitted in August last year, which just highlights the lead times companies have on these devices. While this handset's not the big leap in functionality we're all always looking for when a new phone leaks out, it's surely another few Finn-pounds (or whatever money they use in Finland) in the pocket of Nokia.